A view of the fourth green at Royal Palm Golf. Teachers’ Comments; Lots of fun. I wanted to play again immediately. 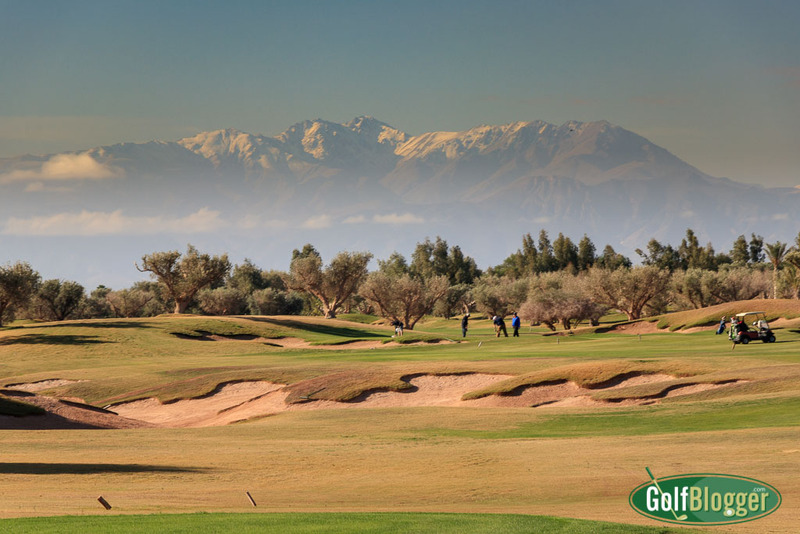 Royal Palm Golf Course in Marrakech, Morocco might best be described as a desert links. Royal Palm is relatively flat and built on sandy soil with hard, fast fairways. There are lots of bunkers, and greens complexes that are open in the front, encouraging a ground game. Wind comes into play. Trees, in the form of light olive groves and scattered palms do not. The course even has a double green. All that Royal Palm Golf Course is missing is an ocean. Along with the cork tree parklands course at Royal Golf Dar Es Salam and the seaside Mazagan, Royal Palm demonstrated the wide variety of golf experiences available in Morocco. Of the three, Royal Palm was the course I enjoyed the most. If a second round was offered after lunch, I would have gone right back out. Royal Palm is located in the shadow of the Atlas Mountains, just outside Marrakesh. Although it was in by far the driest climate of the courses I visited in Morocco, Royal Palm was nonetheless turf from tee to green (and to a fair extent off the fairway as well). In that, it is different from what you might see in a desert course in the American southwest. Royal Palm architect Cabell Robinson has worked for Robert Trent Jones, Sr. and at one point was the general manager of Jones’ European operations. In Morocco, Robinson is not only the architect of Royal Palm but also of Royal Golf El Jadida and the Amelkis club. I did not, however, see much of Robert Trent Jones in Robinson’s design at Royal Palm Golf Club in Marrakech. With wide fairways, few forced carries and accessible greens complexes, Royal Palm offers players a lot of options. Whether your game is is bomb and gouge or slap and pitch, you’ll find Royal Palm accommodating. At 7, 226 yards from the tips, Royal Palm is quite long, but shorter hitters (like myself) will find more friendly distances on the four other tees at 6, 656; 6, 146; 5, 684; and 5, 148 yards. As I caution with nearly every review I write: be sure to play from the correct tees. Even though Royal Palm is a “fun” course, if you play the wrong tees, your score will suffer and so will your ego. Surprisingly for a “desert” course, water was in play on nine holes at Royal Palm, thanks to five large ponds. The course even includes a peninsular par three. I counted 70 plus bunkers — some very long — but these were mostly on the edges of the generous fairways and to the backs and sides of greens. Three of the holes also had large waste areas. My favorite hole was the par four fifteenth. A dogleg left, it plays up a slight rise, the dips down before rising again to the green. Contours around the corners of the fairway and green create a sort of natural amphitheater in which the ball bounces and rolls. A shot aimed directly at the interior corner, or drawn around the turn should take advantage of the embankments and roll toward a good lie. My tee shot was too wide right, which left me with a long shot at the narrow width of the green. That did not turn out well. But I loved the hole anyway. Conditions at Royal Palm were excellent. Greens and tee boxes were in tip-top shape. Fairways were smooth, closely mown and well tended, but as you can tell from the photos. headed to dormancy. There is a curious local rule right on the scorecard which allows a player to lift and clean as though spring rules were in effect. I never had any cause to do so, so I wonder why that is a permanent part of the scorecard. Of the courses I played in Morocco, Domaine Royal Palm was not the most challenging; that title belongs to Robert Trent Jones Sr.’s Royal Golf Dar Es Salam. Nor was it the most beautiful; Gary Players’ Mazagan by the sea had the edge in that department. Royal Palm was, however, the most fun; challenging enough for a majority of players, and on the well-cared-for grounds with views of the Atlas Mountains, gorgeous to behold. The Royal Palm golf course review was first published December 9, 2016, based on a round played on November 21, 2016. 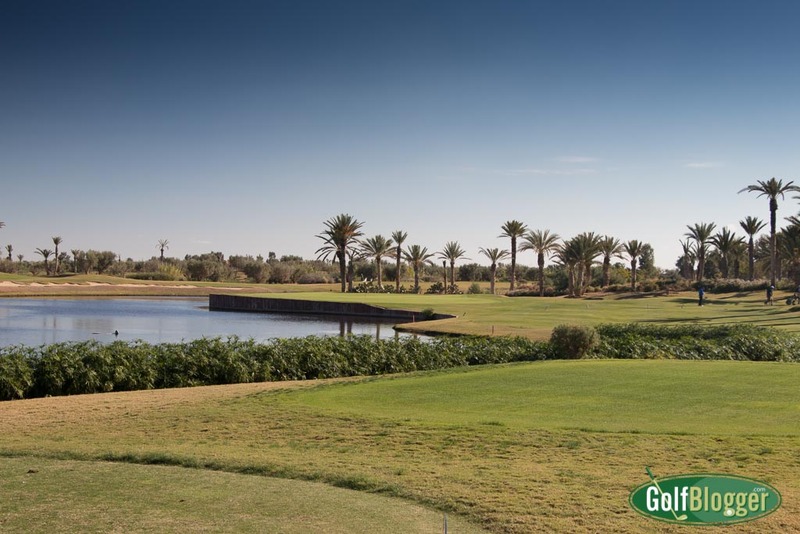 A photo tour of Domaine Royal Palm Golf Course in Marrakech, Morocco, follows. The first at Royal Palm is a 410 meter Par 4. The second at Royal Palm is a 177 meter par 3. The third at Royal Palm is a 327 meter par 4. A view of the green on Royal Palm's Par 4 third. The fourth at Royal Palm is a 344 meter par 4. The fifth at Royal Palm is a 391 meter par 4. The sixth at Royal Palm is a 463 meter par 5. The eighth at Royal Palm is a 417 meter par 4. The ninth at Royal Palm is a 548 meter par 5. The tenth at Royal Palm is a 376 meter par 4. A view from the fairway on Royal Palm's eleventh. The twelfth at Royal Palm is a 177 meter par 3. The fourteenth at Royal Palm is a 314 meter par 4. The fifteenth at Royal Palm is a 455 meter par 4. The sixteenth at Royal Palm is a 500 meter par 5. The eighteenth at Royal Palm is a 382 meter par 4.